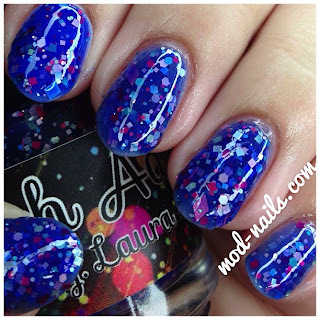 Today I'm wearing Blue Hawaiian by Laura Sanchez, it's a cream/jelly polish with all these little glitter pieces in it which are soo pretty. The color combo is so unique. I'm wearing three coats in the picture above. Click here and bookmark this link so you can buy this amazing polish once it's for sell! It was easy to apply and in person this looks sooo good. The blue is vibrant and the glitter shapes and colors make it look like there's a party in my nails. Visit http://www.shoppolishaddict.bigcartel.com/ and check out all of Laura's other polishes!